Eat At Seven, located on the Level 3 of Suntec City’s newest Sky Garden is home to seven different Japanese concepts and dining experiences with restaurants namely; Enbu, NikuNoHi, Maguro-Donya Miura-Misaki-Kou, Nigiro Cafe and the last three restaurants to open by end of 2015. The 600-seater multi-concept restaurant is founded by Mr. Andrew Tan, the owner of Tomo F&B Group whom has also opened over 30 restaurants and chains both locally and internationally. Together with ANA Trading and Komars Group, this tripartite joint-venture aims to bring the best of what Japan has to offer, all in one place for the local Singaporeans and visitors to enjoy. 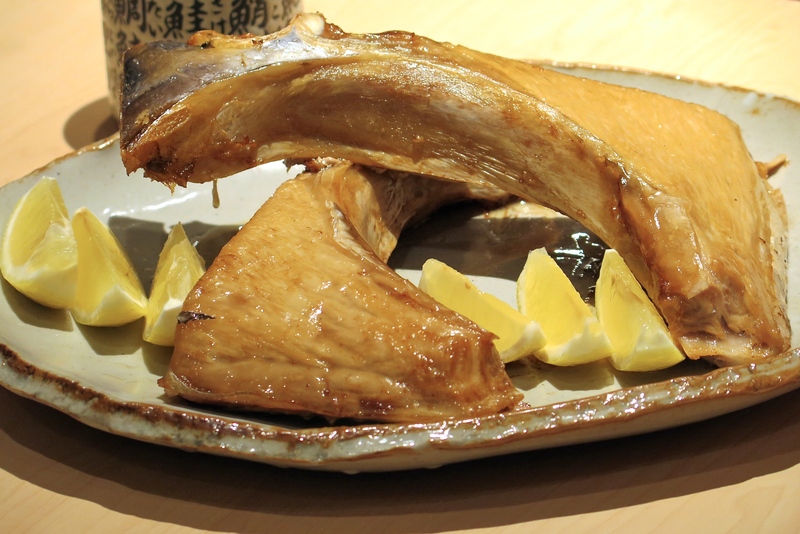 Opened in early June was Enbu, a Warayaki and Charcoal Grill Izakaya that combines traditional cooking methods originating from Shikoku in the Kochi prefecture in Japan with modern and artistic Izakaya-style presentation of the dishes. Diners at Enbu can find a wide variety of alcoholic beverages that goes particularly well with the innovative dishes including the Coedo craft beers ($15), Suntory Kakubin Draft Highball ($10) and more. 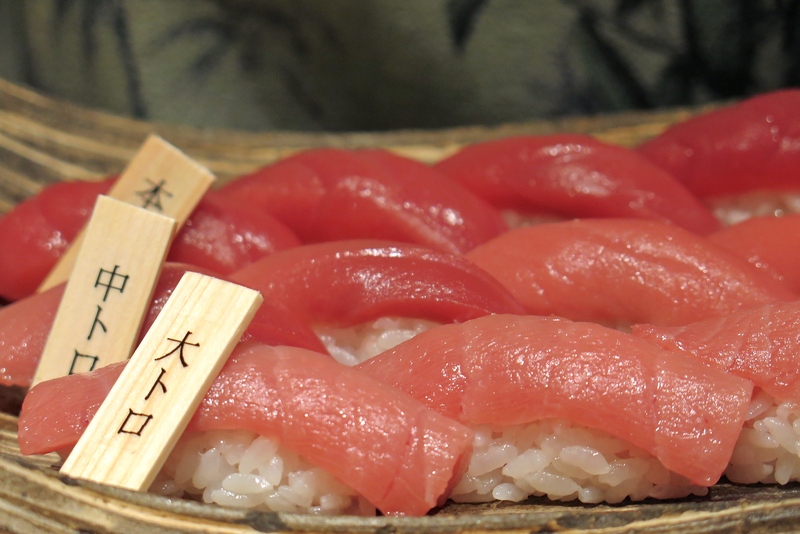 Dine on high quality Maguro (tuna) from Miura-Misaki port and other fresh fishes imported from Japan at Maguro-Donya, headed by Chef Shuji Sawada whom operates a chain of restaurants and sushi stores in Japan. Maguro-Donya Miura-Misaki-Kou Sushi & Dining was the second concept to open in July, at the same time with NikuNoHi and Nigiro Cafe. 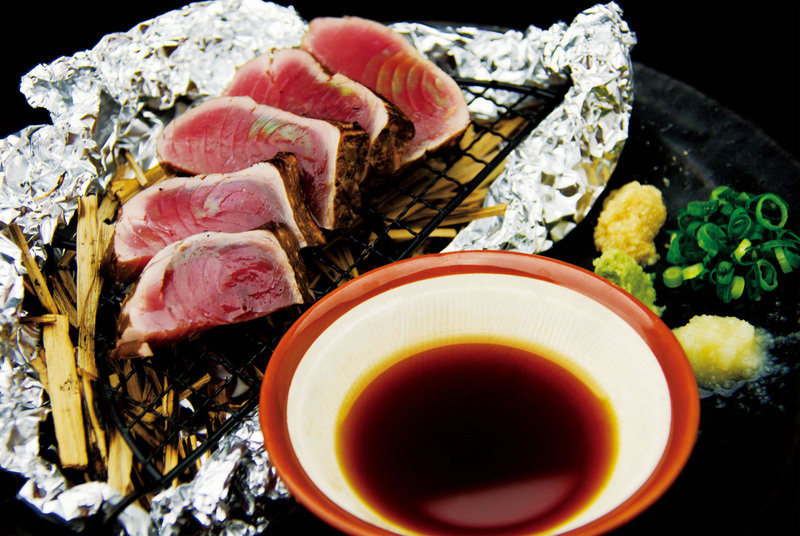 The maguro speciality restaurant at Suntec City offers a fullness and variety of tuna cuisine together with the popular sake and spirits. Fans of Maguro should not miss out the opening lunch special set of Hon Maguro Megumi Trio at $49 (U.P. $79) featuring three parts of the Hon Maguro prepared in different culinary styles and presentation – Hon Maguro Akami Sashimi (Top Loin); Chutoro Steak (Seared Lower Loin); and Kama Yakimono (Grilled Maguro Cheek). Sushi and sashimi are also going at such affordable rates with the Hon Maguro Sashimi Platter priced at $49; featuring five cuts of the Blue Fin Maguro – Akami, Chutoro, Otoro, Kamatoro and Mekajiki; while tuna belly sushi goes at $18 for a pair of Megumi Hon Maguro Gunkan. 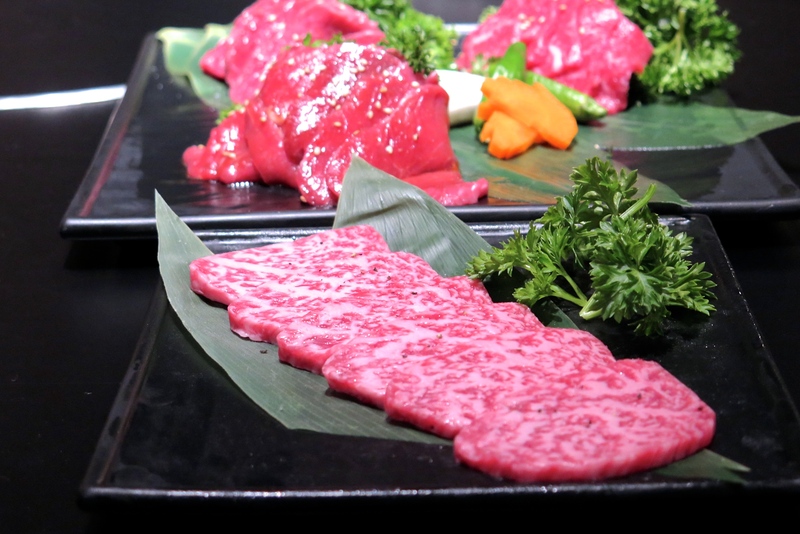 The first NikuNoHi restaurant outside Japan, bringing you a wide selection of quality meats and premium beef, including the highly graded A5 Kuroge Wagyu Beef and up to 23 mouthwatering beef cuts ready to grill at this modern Yakiniku restaurant. We were told that the average waiting time to get into this restaurant in Japan was about 30 minutes, well that wasn’t intimidating as the local diners in Singapore would not mind queuing for good food, even for an hour. You pay good value for good quality and service at NikuNoHi, well-trained staffs can assist in the grilling of the meats upon request; or you can always do it yourself with joy. 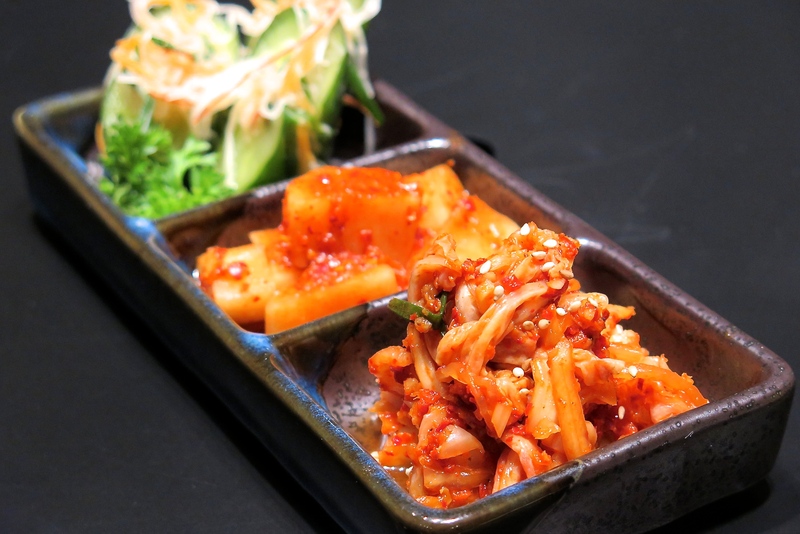 Don’t be surprised to see Korean specialities such as Kimchi and other spicy pickled vegetables at NikuNoHi, as Yakiniku originally referred as barbecue meats was associated to the Koreans during the early Showa period where many Korean grill meat restaurants were opened in Japan, then traditionally termed as Japanese Yakiniku after the post war in Japan. 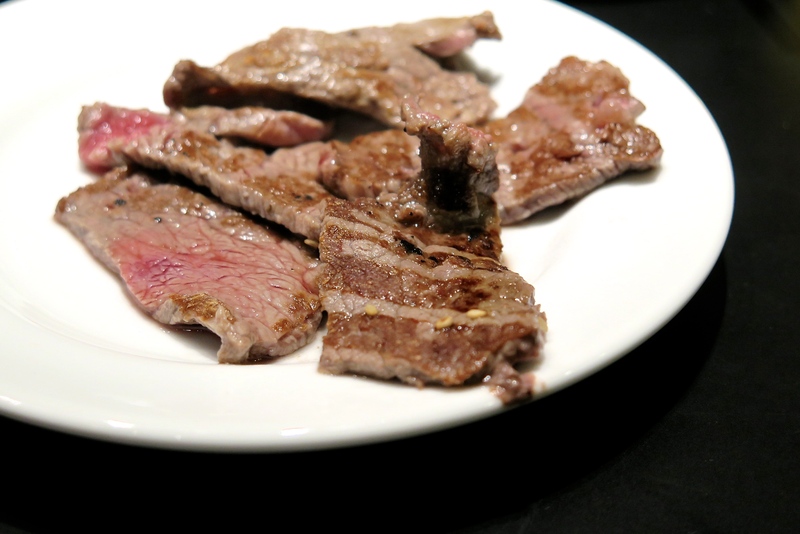 Japanese Yakiniku is a great way to spend time with family and friends, gathering around the barbecue grill table and cook a selection of tantalising meats, coupled with a few appetising sides and tipples. A variety of Italian-style tapas include Ahjio and trippa al pomodro, or the seasonal salad serves as a good starter before eating the meat. It would a be a crime not to order the best-value Premium Rare Plate (150g, $48) showcasing three choices of beef cuts such as the Tomo Sankaku (Tri-tip) boasting a wonderful marbling of the lean meat; Kainomi (bottom flap) the thick sweet layer of fats forming the part of the flank breast and the Eye of Knuckle which is the cut from the centre muscle of the cattle’s hind leg, perfect for roasting and results in a moist and tender bite with rich flavour. For those who fancy a real good steak, simply go for the Japanese Wagyu Sirloin (100g, $42.50) or the Chateaubriand (100g, $50) which are cooked rare to medium rare to achieve the fairly tender texture and juicy flavours. 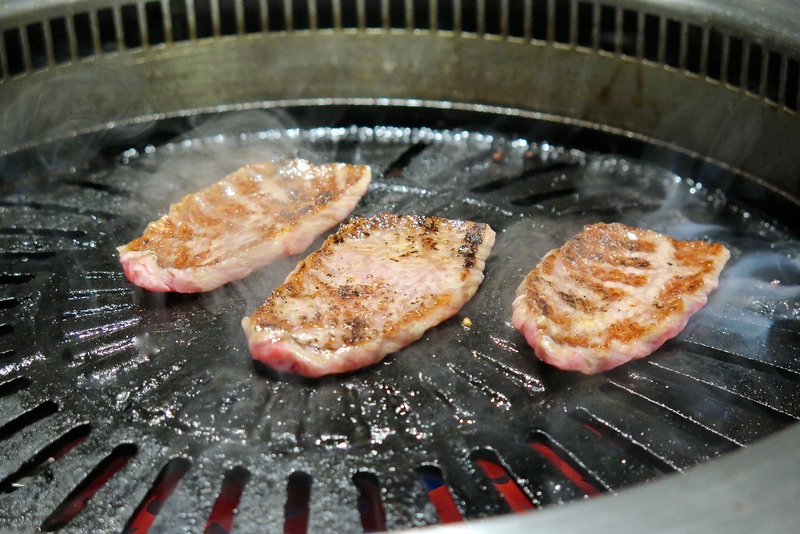 The meats are normally cut into small stripes, so that it can be cooked at the shortest time. 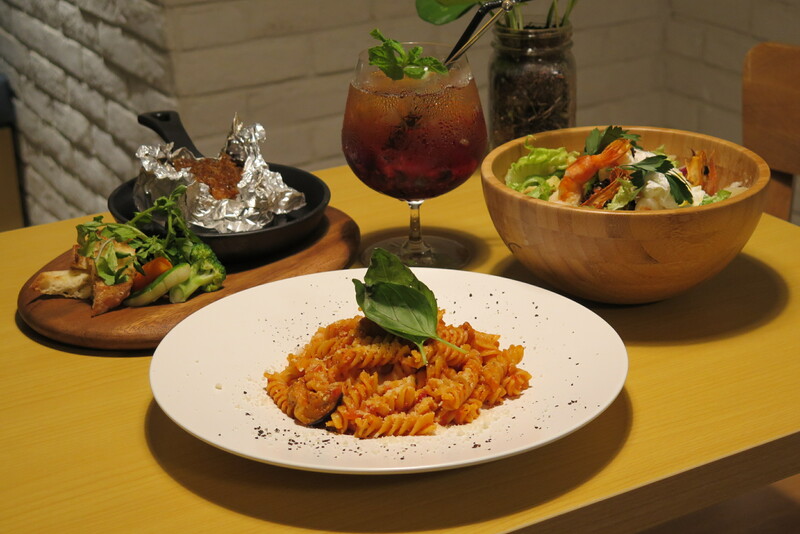 For something light-hearted and casual, head over to Nigiro Cafe which is the first cafe concept by Chef Kensuke Sakai, the youngest challenger to battle on the “Iron Chef” a popular Japanese television cooking show and culinary competition. 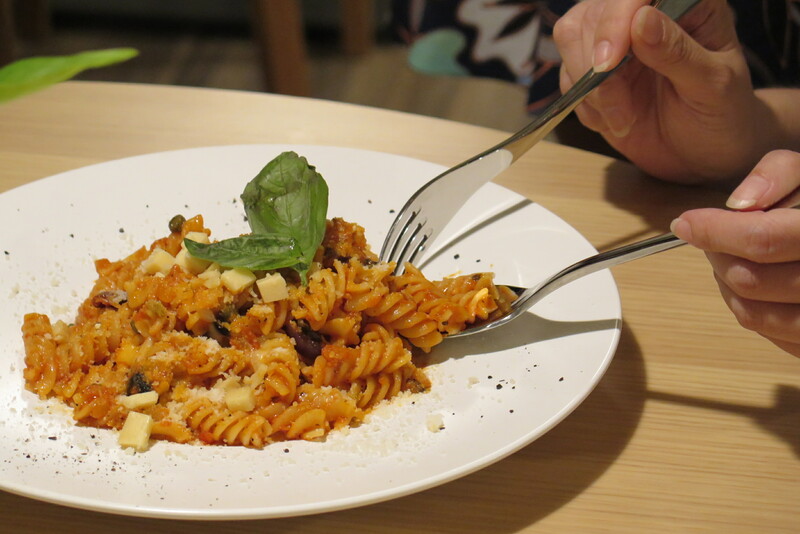 The Japanese cafe focus is on Italian cuisine cooking and naturally, pasta dishes feature more prominently, like this signature Short Pasta Melanzane ($19) which is cooked with eggplant with three types of cheese and tossed in tangy tomato sauce. Enjoying Italy in the moment, salad lovers can look forward to the Grilled Prawn Nigiro Caesar Salad ($9.50 half/$20 full) consisting crunchy leafy greens with grilled prawns, croutons, cheese and poached eggs in caesar dressing, which this dish was touted as “Tokyo’s Best Caesar Salad” by Hanako, a Japanese lifestyle magazine. Other signature dishes include the Nigiro Hamburg Steak ($24), Eggs Benedict and Deux Fromage Cake.